It’s almost 2019, and (along with some fun surprises from Saffire!) that means a whole new year to connect with your friends on social media. Social media is constantly changing, but new features and ways to engage with your followers make it an exciting time to connect. Here are our top social media trends to try next year. 2018 was the year of the “story,” and it’s not going anywhere anytime soon. This year, the feature blew-up on Snapchat, Facebook, Instagram, and is even being integrated on YouTube and LinkedIn. Gone are the days when posts were seen as highlights of the past. In 2019, it is all about in-the-moment content. With some 400 million daily Instagram Story users, it is clear that audiences expect to have a more intimate relationship with brands than ever before. This is especially true for Millennial and Gen-Z consumers, who rate authentic relationships and FOMO as key influences for engagement and brand loyalty. For brands, this means constantly keeping fans involved – and stories are a great way to get started. Rumor has it that the internet has not slept since it was born in 1983. Nowadays, consumers are constantly on the go with their devices in hand. People have come to expect almost instant responses when sending comments and private messages online. Because of this, organizations are learning that they must keep up with the demand from their customers. Facebook has also been adding new features to its Messenger app and rewarding business pages for maintaining high message response rates. It is clear that the social media giant sees messaging as a key tool in 2019, and Facebook isn’t the only one who feels that way. Studies show that more than 1.5 billion people use WhatsApp and other messaging apps each month. Anyone with an Instagram page knows that influencers have quickly become this generation’s celebrities. While working with powerful well-known influencers can get you big results, it can also be costly. That’s why many brands are now choosing to work with smaller social media users called “micro-influencers.” While they may not be celebrities, studies show micro-influencers still have great influence over their audiences – think of it as word-of-mouth marketing for the internet age. They key is to find relevant and trustworthy accounts to partner with. The best part? Unlike celebrity influencers like Kim Kardashian, who are known to charge up to $500,000 a post, 83% of micro-influences charge under $250. Try searching for accounts using hashtags related to your organization. Keep a lookout for profiles with high engagement and eye-catching posts. Every marketer has been faced with the question – “how will social media directly contribute to the bottom line?” In 2018, Facebook and Instagram finally answered our question with shoppable posts, allowing users to buy their favorite products without ever leaving the app. Shoppable posts on Instagram and Catalogs on Facebook are a great way to help customers discover and purchase your merch. The key, however, is to remember to distinguish your post from other e-commerce by keeping it fun and interactive. It is still social media, after all. Social media is all about creating a stronger relationship with your customers. In 2019 remember to build genuine relationships, put your customers first and have fun! That’s the magic recipe to a successful and profitable year on social! Snapchat! Facebook! Instagram! Other than all being social platforms what do they have in common? “Stories!” Snapchat created the original Stories feature where users could upload snippets of their life and offered fun photo filters that would change your face, voice or background. In the past nine months, both Instagram and Facebook have released their own Stories feature and it looks almost identical to Snapchat’s version. Where should you tell your Story? So now that the three big social media platforms have the same feature, which one should you use to tell your Story? Well first off, Facebook is seeing incredibly slow growth in utilization of the Story feature. Additionally, Facebook isn’t allowing Facebook Pages to create a Story yet, as this is currently only for individual profiles. We imagine this will be rolled out to Pages and advertisers sometime over the next year. The advantage of Instagram Stories is that if you already have a maintained Instagram profile, you do not need to acquire new followers like with Snapchat – you have instant reach because of your existing followers. Additionally, Instagram Stories has surpassed Snapchat with the most daily users, with 50 million users using Stories! Not surprisingly, there has been a significant decline in Snapchat usage and downloads since the launch of Instagram Stories. The functionality is just too similar. However, Snapchat has captured a much younger audience than Instagram, which is heavily used by Millennials that are starting to move into their thirties. Snapchat is still the perfect platform to capture this younger audience. One of the great things about Stories is that you can save the video to your device from any of the three platforms, so there really is no reason to choose just one! Get out and make some great content and post it to Snapchat, save it and then upload it to Instagram Stories and finally head over to Facebook and upload your video to your Page’s timeline! Someday you should be able to upload directly to Facebook stories, but in the meantime, newsfeed videos are still very attention grabbing and successful. As you know, video content is king, so get out that phone and start creating content! Author SaffirePosted on June 9, 2017 Categories Saffire, Social Media, Tips & TricksLeave a comment on What’s Your Social Story? Are you having trouble staying organized? Is your wall calendar just not keeping up in the digital world? Here at Saffire, we’ve started using Trello to stay organized! Trello is a collaboration tool that organizes your projects into boards. In one glance, Trello tells you what’s being worked on, who’s working on what, and where something is in the process. Trello uses “cards” which contain each of your tasks or ideas. In each card, you can add members, labels, checklists, any attachments and even a due date. Each card is filed under a list and can be easily moved from list to list. For example, you can have a “to do” list, “overdue” list and a “completed list” and easily move the cards to their appropriate list. Cards and lists are then housed under boards in order to stay organized and keep your projects separate. You can also add an unlimited number of members to a Trello board in order for multiple people to collaborate. 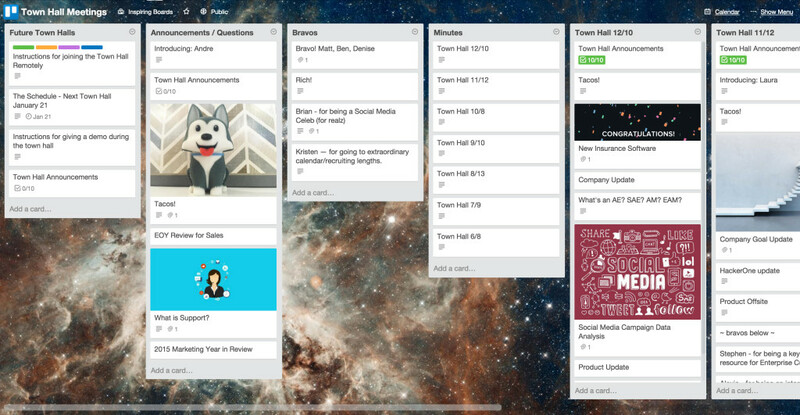 Trello boards can be extremely effective as both a meeting agenda and task tool. We use trello boards to list out our agenda in cards. Then, we take notes under each agenda item, assign a task to someone and put a due date on that action item. Another great way to utilize Trello is to place your marketing editorial calendar into a board. You can switch to a calendar view and anyone on your team can see what posts, emails or content is scheduled to be published so your team can plan accordingly, whether that means graphic design or preparing copy for social media. For our event planners, this can be an extremely powerful tool to help keep your event prep work organized. Tasks can easily be seen by your team such as when tickets go on sale or entertainment announcements are made. As we all know, plans can drastically change and Trello makes changes easy! Simply drag & drop a card onto a new date on the calendar and the due date will update automatically. There are endless uses for this powerful tool! Let us know if you use Trello and how you use it!